Buy your Cake and Eat it! Hi brides-to-be, bloggers, readers and any other wedding goers! The wedding prep has died down a little, as with over a year to go still, there isn’t a lot to do in the present. We have the venue and the registrar. So the WHERE and the WHO bits of our wedding are taken care of – what else could you need? A lot it seems. One of those things being a cake. Cakes are used as part of a lot of English celebrations – and it seems at a wedding, not only is it a tasty treat for your guests, but it has to be a fantastic, wowing centre piece! The wedding cake is traditionally cut by the bride and groom and eaten by the guests at the wedding reception. I have many memories of taking pieces home though – as you are usually full up of yummy wedding food. And with the price of the Wedding Breakfast food and evening food, people best be full!!! 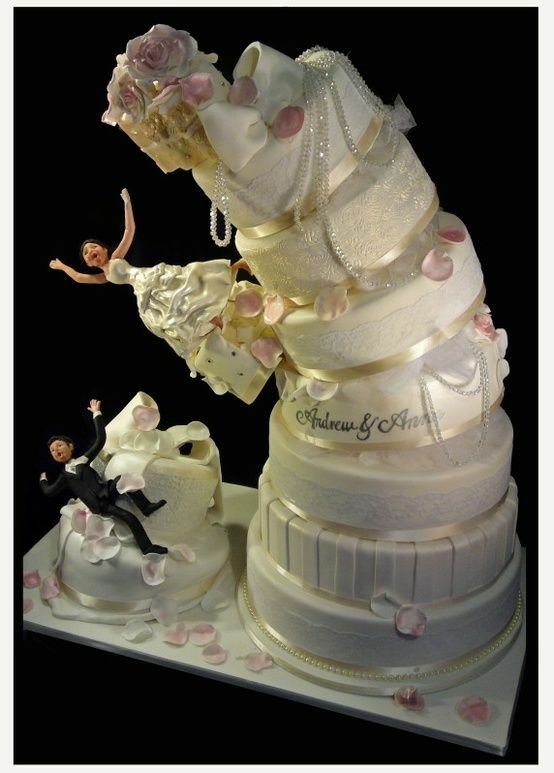 I’ve also read that wedding cake used to be broken over/thrown at the bride as a symbol of fertility. Wasting a few hundred pound cake by throwing it about is like throwing money down a drain: who could ever afford a child?! Crazy ideas – again to me, it could be eaten not thrown about like a ball. Plus it could get on my lovely dress! 1.) The first pic is hilarious and would be very fitting for our clumsiness! Love it! I imagine a lot of effort would have to go into that though. 2.) The one on the left is really cool. Pictures printed around each side of the couple. 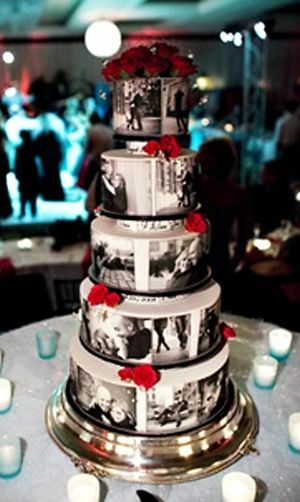 Kenny has an idea to get photos on a supermarket cake as a cheaper way of doing it! Mmmm…. will see about that! 3.) 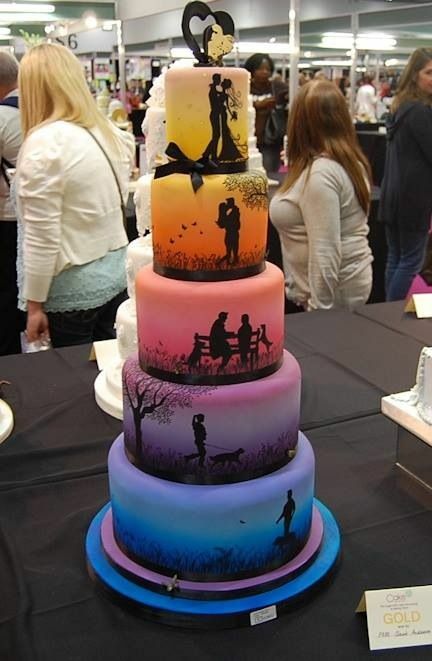 I’m not sure we would need this many layers, but I love how each one tells a story of the love between the couple! Love the colours too. So, there are some cake ideas – will need to look at lots more and do plenty of testing I imagine too 😉 Any tips or ideas – please comment below!